It is hard now for us to imagine just how much changed with the advent of the railway. Transport had been slowly improving, and the Industrial Revolution had coped remarkably well with natural waterways and artificial canals. It wasn’t until the first passenger railway opened between Stockton and Darlington in 1830, though, that it was feasible to move a lot of people overland fairly quickly. Within a decade, railways were being constructed all over Europe and across North America. By the end of the century, express steam trains were whistling people from London to the Highlands of Scotland, and from Paris to the Mediterranean coast, in a matter of a few hours: journeys which previously would have taken days or even weeks. Railways also had huge effects on society. People who had spent every night of their life in a small town or village could get on a train and be moved tens or even hundreds of miles before nightfall. Whole countries were forced to adopt uniform time, instead of drifting along in vague link with the sun, or the clock tower in the next town. Daily routines even in the deepest country areas suddenly became linked with the arrival and departure of trains. The railways brought other infrastructure with them: bridges over rivers, gas supplies (made from coal) for lighting and sometimes even heating, rapid communications, newspapers, and more. New words and phrases were rapidly added to our languages, as the way – the railway jargon for the railway, spookily parallel to Christian religious use – made its way across Europe, North America, and much of the rest of the world. Joseph Mallord William Turner (1775–1851), Rain, Steam and Speed – The Great Western Railway (1844), oil on canvas, 91 x 121.8 cm, The National Gallery, London. Wikimedia Commons. 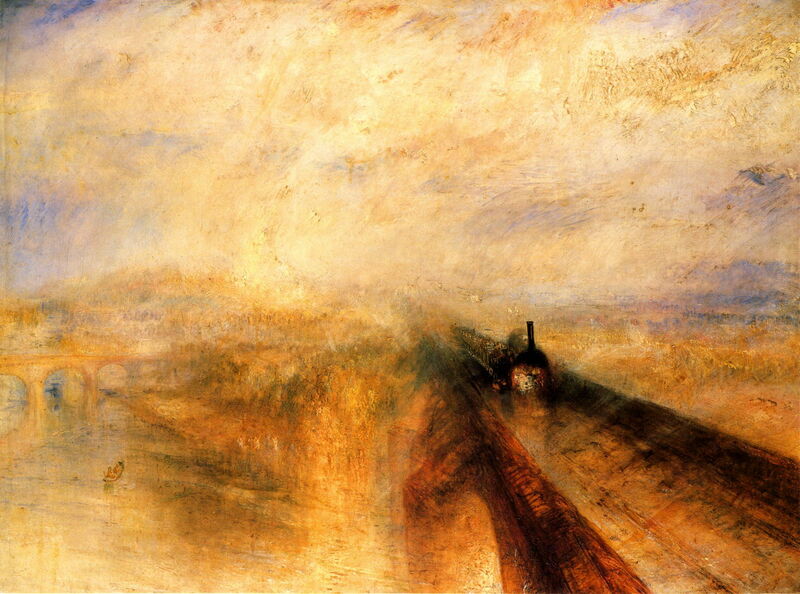 JMW Turner anticipated some of these in his remarkably early Rain, Steam and Speed – The Great Western Railway (1844). Showing one of the very early steam locomotives built for Isambard Kingdom Brunel’s huge and innovative Great Western Railway, this express is crossing the River Thames at Maidenhead. Until then, that had been a sleepy country town; now it was within commuting distance of the centre of London. William Powell Frith’s The Railway Station (1862) captures some of the atmosphere of a major railway station in a capital city – in this case, Paddington Station in London, which by odd coincidence was Brunel’s terminus for his Great Western Railway. Stations like this became a focus of activity, emotional partings and arrivals, migration, and a fair bit of crime too. William Hahn (1829–1887), Southern Pacific R.R. 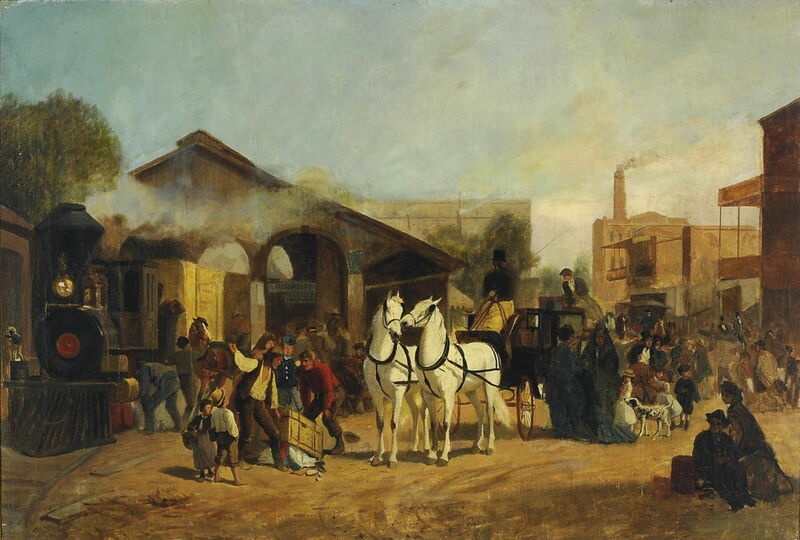 Station at Sacramento (c 1873-74), oil on canvas, 64.7 × 94.6 cm, location not known. Wikimedia Commons. The railroad also spread across the far greater distances of the USA and Canada. William Hahn’s Southern Pacific R.R. Station at Sacramento (c 1873-4) shows it during its rapid growth there. Édouard Manet (1832–1883), Le chemin de fer (The Railway) (1873), oil on canvas, 93.3 × 111.5 cm, The National Gallery of Art, Washington, DC. Wikimedia Commons. France had been an early innovator and adopter, although such non-classical motifs would not have been appropriate for the Salon, of course. 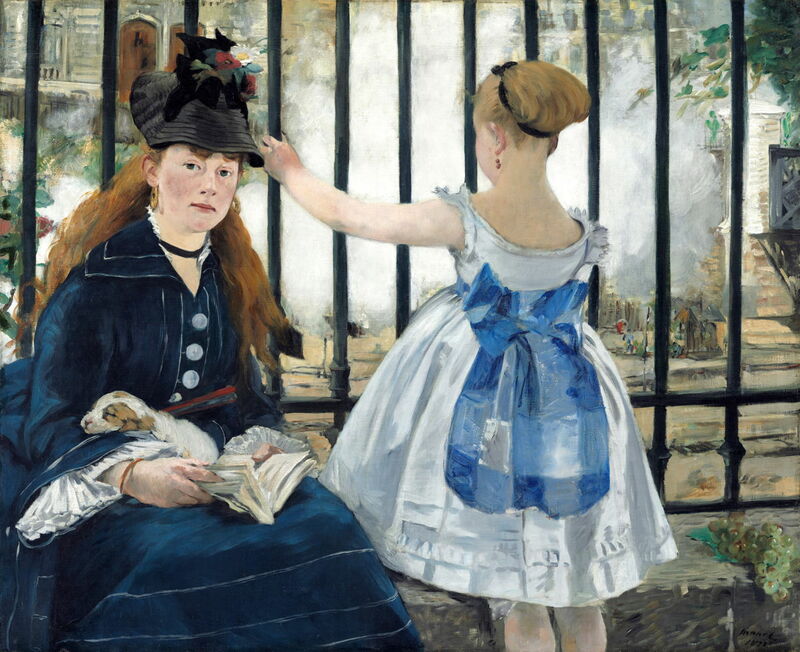 It took Édouard Manet painting his favourite model Victorine Meurent, in Le chemin de fer (The Railway) (1873), to break the ice. Its background is the Gare Saint Lazare in Paris. It was completed and sold in 1873 to the singer and avid collector Jean-Baptiste Faure, and astonishingly was the only painting of three submitted to the Salon by Manet the following year to be accepted. Its appearance in the Salon provoked outrage and ridicule, and a torrent of sarcastic cartoons in the press. Near Manet’s painting in the Salon, a couple of works by Giuseppe De Nittis were given a much warmer reception. 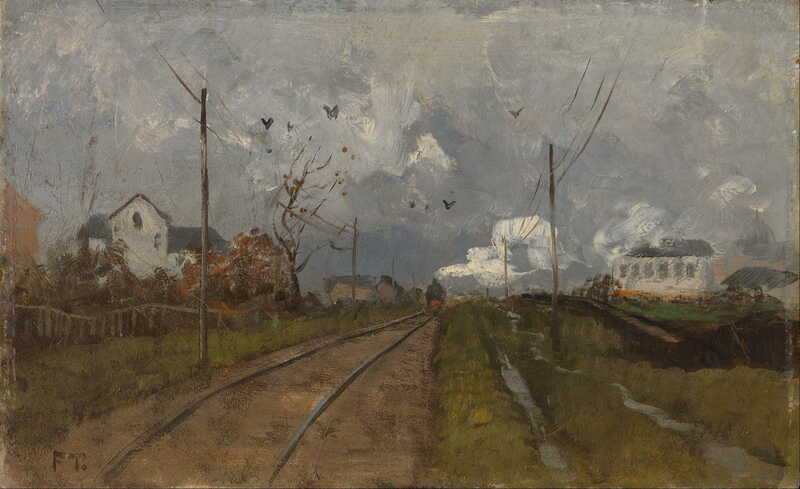 Yet sometime between 1869 and 1880, De Nittis painted The Passing of a Train, his unashamed comment on the coming of the train. As De Nittis, Monet, Pissarro, and the other Impressionists started painting in even more unacceptable styles around Paris, trains and railways started to appear even more. Claude Monet (1840–1926), The Railway Bridge at Argenteuil (1873), oil on canvas, 60 × 99 cm, Private collection. Wikimedia Commons. 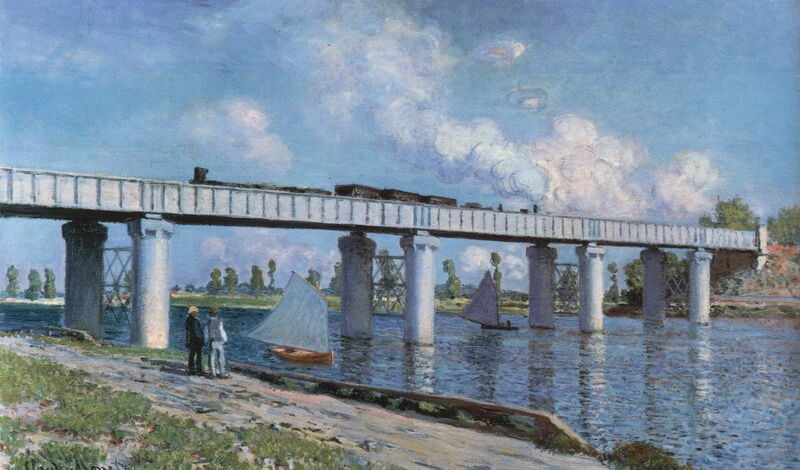 Claude Monet’s The Railway Bridge at Argenteuil (1873) is one of his several landscapes centred on the railway from the years immediately after the Franco-Prussian War. At this time, Monet was a regular commuter by train: when he, Camille and his son moved out to Argenteuil at the end of 1871, he travelled the then short distance to Paris by train. 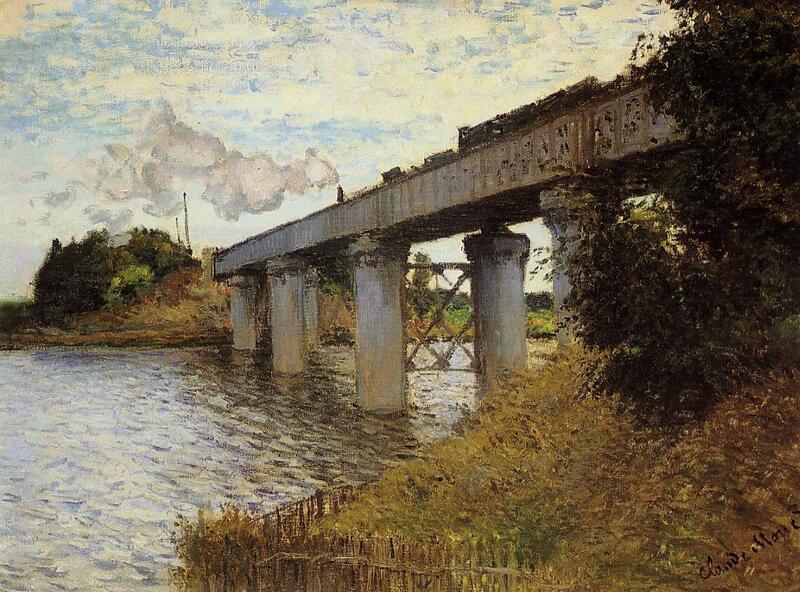 Claude Monet (1840–1926), The Railway Bridge at Argenteuil (1874), oil on canvas, 54 × 71 cm, Musée d’Orsay, Paris. Wikimedia Commons. Monet liked this bridge so much that he painted it again the following year, in his The Railway Bridge at Argenteuil (1874). 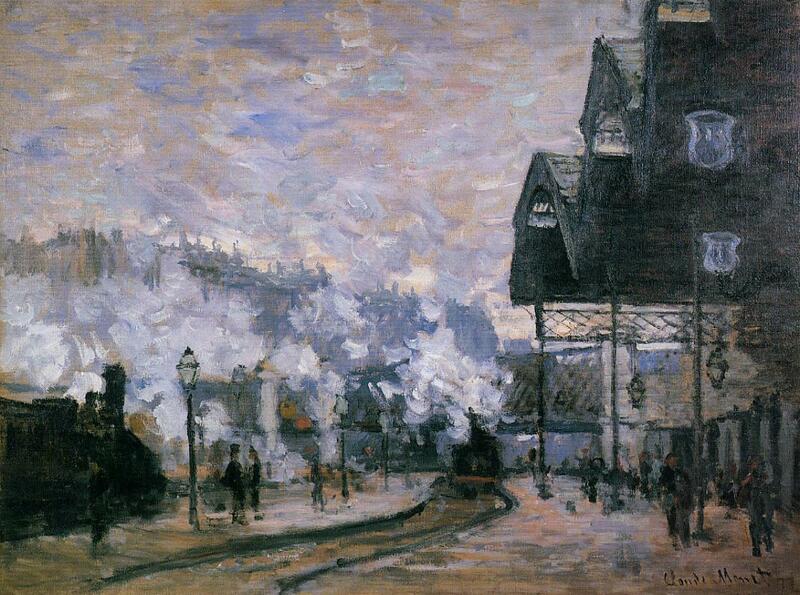 It was in 1877, though, that Monet became the most painterly railway buff of them all. By then, he was becoming detached from Argenteuil, and sought a new, radically modern, and urban theme. Where more appropriate than the steaming hubbub of the Gare Saint Lazare? Caillebotte paid the rent for him on a small studio nearby, and Monet gained approval to paint in the station. 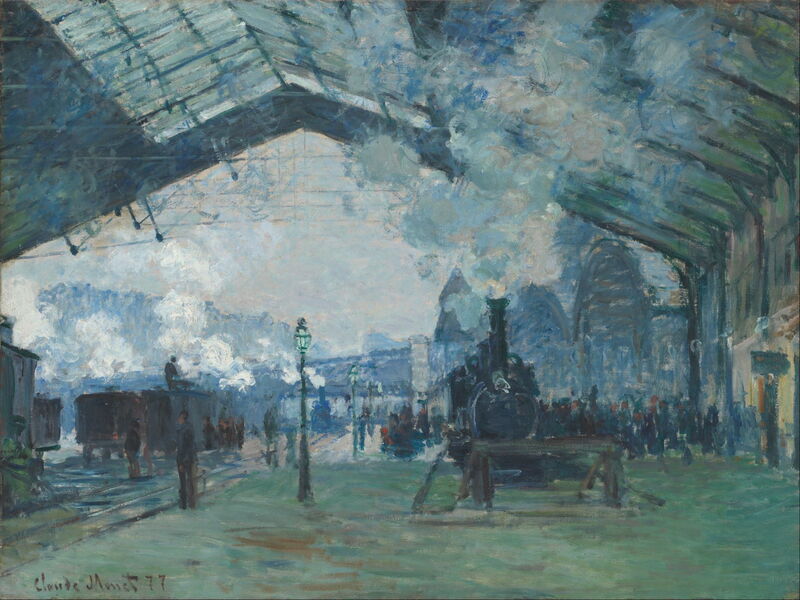 By the third Impressionist Exhibition of April 1877, Monet had assembled seven views of the station, including one which even seemed to please the critics. 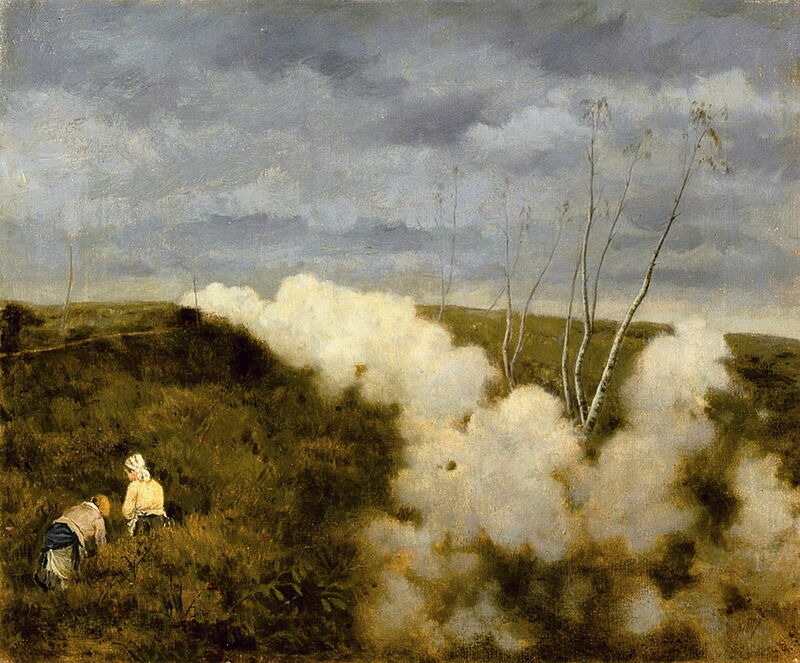 Among the paintings from that campaign is his Arrival of the Normandy Train, Gare Saint-Lazare (1877). Claude Monet (1840–1926), Train Tracks at the Saint-Lazare Station (1877), oil on canvas, 60.5 × 81.1 cm, Pola Museum of Art, Hakone, Kanagawa, Japan. Wikimedia Commons. Monet was too smitten to stop in the station, though. 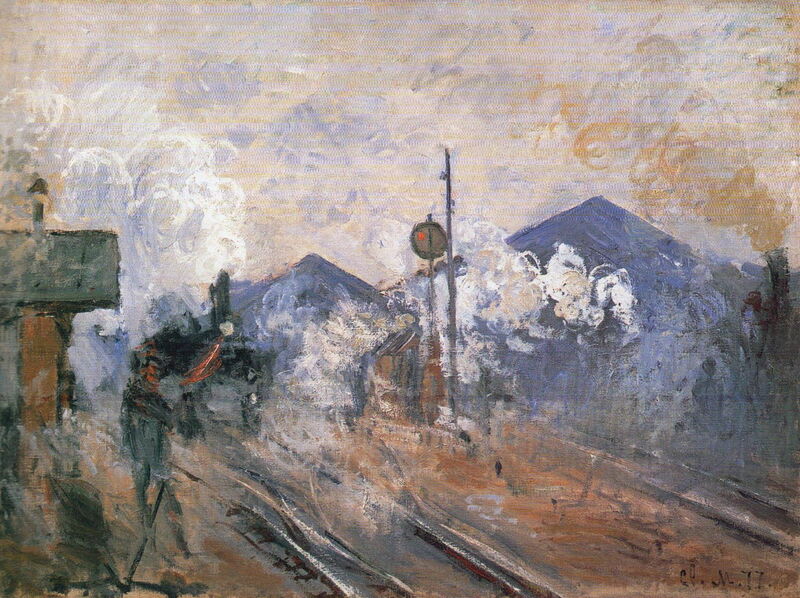 In his Train Tracks at the Saint-Lazare Station (1877) he reversed the view and started to show signalling. Claude Monet (1840–1926), Saint-Lazare Station, the Western Region Goods Sheds (1877), oil on canvas, 60 × 80 cm, Private collection. Wikimedia Commons. He went even further in his Saint-Lazare Station, the Western Region Goods Sheds (1877), showing the working parts, and the smoky city beyond. Frits Thaulow (1847-1906), The Train is Arriving (1881), oil on canvas, 14.5 x 24 cm, National Gallery (Norway), Oslo. Wikimedia Commons. Although Norway was a far greater challenge for the railway engineers, Frits Thaulow seized the opportunity to show the results in his The Train is Arriving (1881). 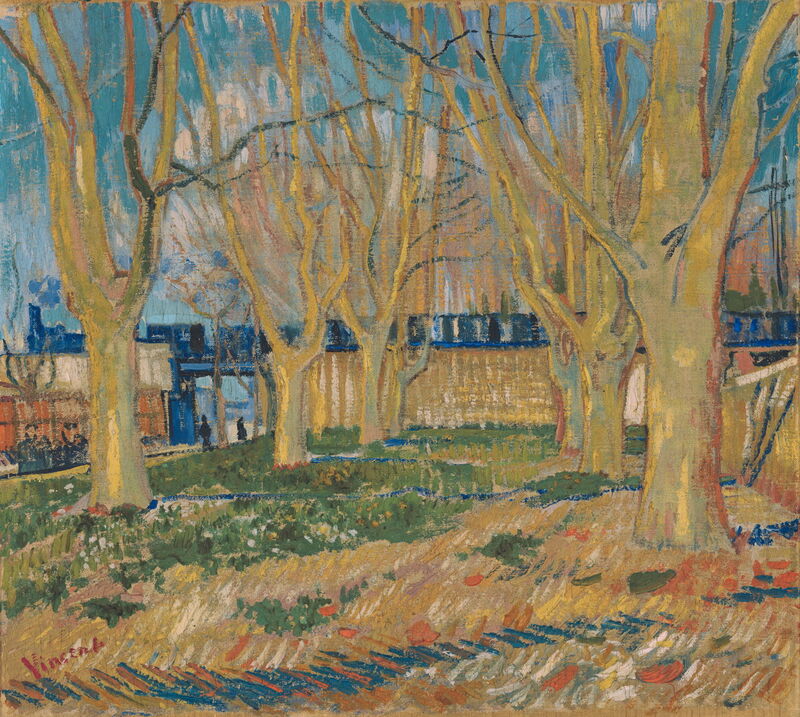 Vincent van Gogh also gave us his The Blue Train (Viaduct in Arles) (1888). For artists, railways were much more than modern and exciting motifs. As with Monet at Argenteuil, they quickly became an important tool. If Cézanne had had to travel between Paris and Aix-en-Provence by carriage instead of by train, we would have far fewer of his paintings to enjoy today. It is also worth remembering that the prominent light ochre structure sweeping across many of his views of Mont Saint-Victoire is the long viaduct build to accommodate the railway. The introduction of express services between Paris and Provence also changed the course of painting. With the Mediterranean coast so accessible, more and more made the journey to paint in what were then undeveloped and unspoilt villages, with their remarkable climate and distinctive light. 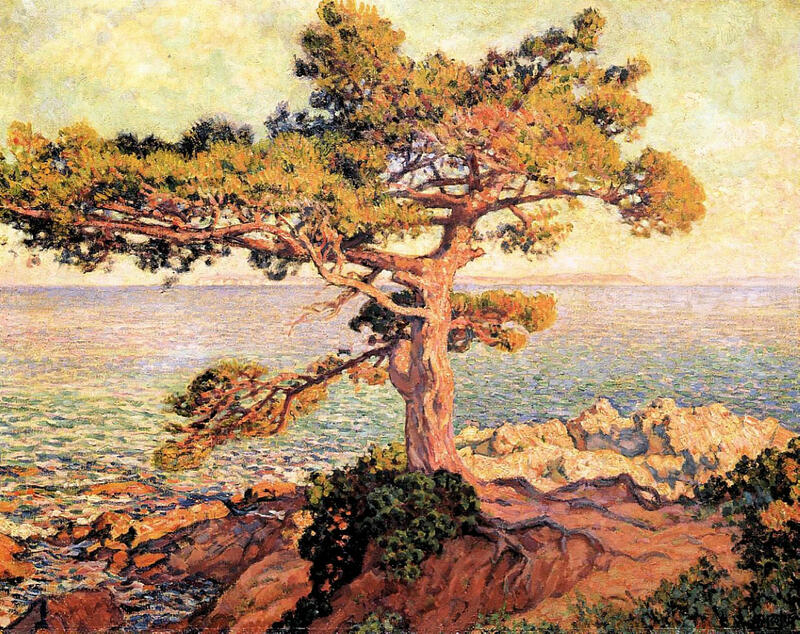 Théo van Rysselberghe was one of the many to travel and eventually settle in the south, painting works such as his Pine by the Mediterranean Sea (1916). By the twentieth century, railways were a very important part of life for many of the people. Painting trains became something of a sub-genre, particularly now that steam trains have almost disappeared in Europe. Eric Ravilious (1903-1942), Train Landscape (1940), watercolour and pencil on paper (collage), 44.1 x 54.8 cm, Aberdeen Art Gallery & Museums Collection, Aberdeen, Scotland. WikiArt. 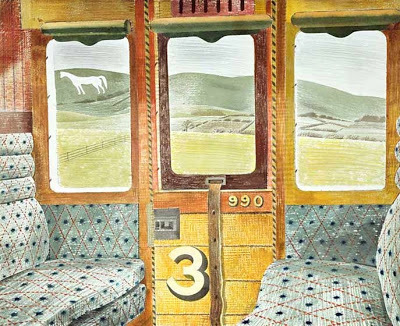 Eric Ravilious is one example of a twentieth century artist who painted motifs deeply embedded in the railway, in his Train Landscape (1940). The story of the railways and painting has one final twist. Between 1898 and 1900, a new railway station, initially known as the Gare d’Orléans, was built on the bank of the Seine at Quai d’Orsay, Paris. The first electrified urban railway terminal in the world, it was a star of the Exposition Universelle in 1900 – at which many Impressionist paintings were exhibited. Victor Marec (1862-1920), Construction de la gare d’Orléans en 1899 (Construction of the New Gare d’Orléans Station in 1899) (1899), media and dimensions not known, Musée Carnavalet, Paris. Wikimedia Commons. 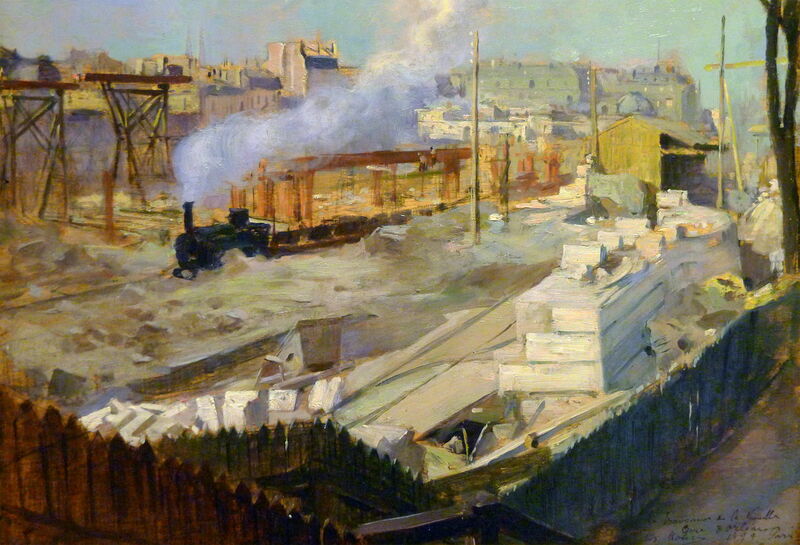 Victor Marec’s painting shows construction work being progressed in 1899. The Gare d’Orsay, as it became, started to suffer physical limitations in 1939, and its upper levels closed from 1973. In 1986 it re-opened as the most extensive collection of Impressionist art in the world, the Musée d’Orsay. Wilson-Bareau J (1998) Manet, Monet, and the Gare Saint-Lazare, Yale UP and the National Gallery of Art. ISBN 978 0 894 68230 8. Posted in General, Painting, Technology and tagged de Nittis, Frith, Hahn, Manet, Marec, Monet, painting, railways, Ravilious, Thaulow, trains, Turner, van Gogh, van Rysselberghe. Bookmark the permalink. Thank you: I hoped that it would be of interest.